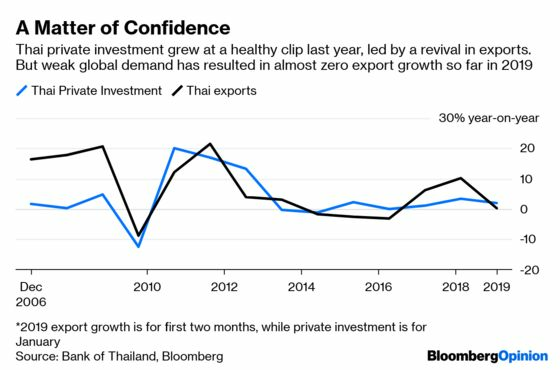 (Bloomberg Opinion) -- More than a week after Thailand’s first election in eight years, there’s still little clarity about the nation’s political future. The more frustrating that stalemate becomes, the bigger the incentive for Bangkok businesses to venture overseas. The March 24 polls, it seems, have solved nothing. If holding elections under a new constitution (Thailand is on its 20th since the end of absolute monarchy in 1932) was supposed to lift politics from the streets and bring it into parliament, then any resumption of violence would spark a search for fresh solutions. All over again. As long as the village vote supports deposed former Prime Minister Thaksin Shinawatra – and the Bangkok elite continues to find his populism intolerable – future attempts to steady democracy will also fail. The unambiguous message to entrepreneurs is that they should keep investing abroad. 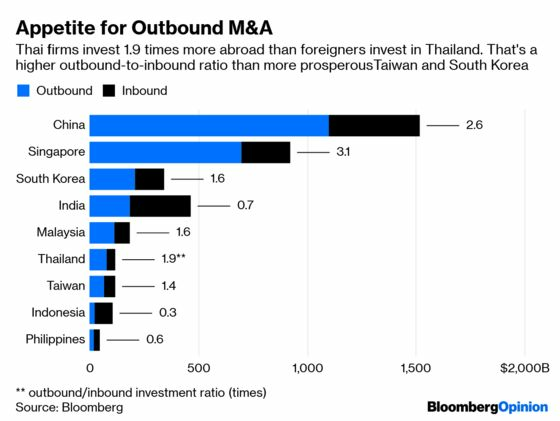 Since 2001, Thai firms have led or taken part in $78 billion of overseas M&A, including 17 large deals of $1 billion or more. The big push got underway as democracy started flickering in the country, before getting snuffed out by the 2014 coup. Private investment in the domestic economy waned with slowing global demand. In December 2012, when the now 79-year-old Thai billionaire Dhanin Chearavanont made a $9.4 billion play for a large stake in Ping An Insurance (Group) Co., Thaksin’s sister Yingluck Shinawatra had just survived a no-confidence vote over a costly subsidy to rice growers. She would hang on to power for another year and half, even as her government became increasingly ineffectual. After her ouster, Dhanin’s Charoen Pokphand Group Co., together with Japanese trading house Itochu Corp., picked up a stake in Beijing-controlled investment corporation Citic Ltd. for $10.4 billion. The other billionaire to make a move in 2012 was Charoen Sirivadhanabhakdi, who got Singapore’s Oversea-Chinese Banking Corp. to offload its stake in Fraser & Neave Ltd. to his flagship Thai Beverage Pcl. That opening led to an $11 billion takeover of F&N’s property and drinks empire. In 2016, Dhanin acquired a U.S. frozen-food producer while Charoen lost the battle for hypermarket chain Big C Vietnam to the Central Group, controlled by the prominent Thai retailer and hotelier Suthikiati Chirathivat. The Thai tycoons’ bid to globalize is in a league of its own. While China has spent $1.1 trillion overseas since early 2001, foreigners have also bought $418 billion worth of Chinese businesses. That gives the People’s Republic an outbound-to-inbound investment ratio of 2.6. Relentless shopping by Singapore’s sovereign wealth fund GIC Pte. and state investment firm Temasek Holdings Pte., have accorded the city-state an even higher measure of 3.1. In developing Asian countries where labor is young and cheap and local opportunities lucrative, the ratio is markedly lower: 0.3 in Indonesia; 0.6 in the Philippines; and 0.7 in India. Surprisingly, Thailand is closer to Singapore and China than to India or the Philippines. Its per capita income is a fifth of South Korea’s, 73 percent less than Taiwan’s, and a third lower than Malaysia’s, but its outbound-to-inbound investment ratio of 1.9 is higher than all three. When political institutions fail to act as pressure valves, capital wants to escape before it gets trapped. In Thailand’s case, an added attraction is what Nirgunan Tiruchelvam, head of consumer-sector equity research at Exotix Partners LLP in Dubai, describes as “first-world cost of capital in a third-world country.” Thai Beverage, rated one level above junk by Moody’s Investors Service Inc., recently raised the baht equivalent of $317 million for 10 years at a yield of 4 percent. American issuers of similar creditworthiness have on average paid 4.6 percent this year for borrowing in dollars, according to Bloomberg data. With capital so cheap, the longer the political confusion lingers, the more ardently Thai tycoons will venture abroad. Assets in the neighborhood hold the most appeal. It’s Asia’s chance to bathe in baht.